Combining multiple measurement capabilities into a single instrument is generally advantageous over installing separate devices to cover an array of parameters. A simple reduction in fittings and connection complexity can bring enough benefit to justify a selection of an instrument with expanded functionality. Spirax Sarco provides a multivariable rotor insertion flowmeter, available in four configurations to match a broad range of flow measurement needs. All are based on a turbine rotor which is inserted in the fluid flow path. The instrument detects passage of the turbine blades by a sensor, using the measured frequency to determine flow velocity. Further processing with other measurements can provide volumetric and mass flow. 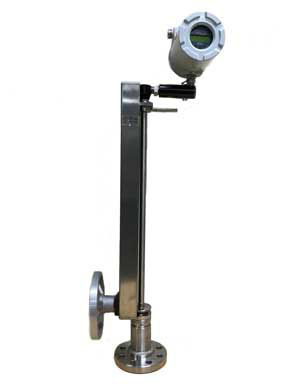 One version of the instrument delivers only volumetric flow rate. A second variant adds a temperature sensor and is capable of providing a temperature compensated mass flow reading. This model is often applied for measuring saturated steam. A fuller featured version incorporates a pressure sensor along with the temperature sensor and can function as a flow computer, providing instantaneous readings of mass flow rate for gases, liquids, or steam. Several output signals can be configured to provide a selection of mass flow rate, volumetric flow rate, pressure, temperature, or density. There is also a product version specifically intended for energy monitoring in applications involving steam, chilled water, or hot water. This multivariable version provides energy usage readings in selectable units, as well as supply and return temperatures, delta T, mass total and energy total. The unique insertion design measures liquids, or gases, including steam, and can be installed without line shutdown. The unit is suitable for applications on line sizes from 2" to 80". More detail is found on the data sheet included below. Contact an instrumentation specialist and share your flow measurement requirements and challenges. The combination of your process knowledge and their product application expertise will produce effective solutions.